Easton Business Centre has 2 Meeting rooms available for hire between the hours of 8:30am and 5:30pm Mon-Fri. The rooms are very popular with onsite businesses, external companies and larger organisations, such as IKEA and Berghaus. The Conference Room next to our Reception has a capacity of up 40 people theatre style seating, 25 classroom, 20 in a board room setting and 16 U shape. It is a light and spacious room suitable for training events, boardroom style meetings and small conferences. The room measures 8.1m x 5.5m. 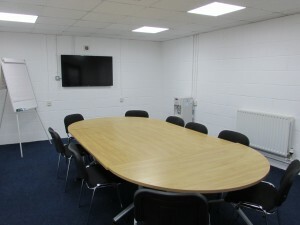 We have recently installed a 55″ monitor which is great for professional presentations and training sessions. Included in the hire charge for The Conference Room is self service tea and coffee, flipchart, whiteboard & pens and use of the monitor. Wi-Fi is included too. Please advise Reception of your requirements when you confirm your booking. 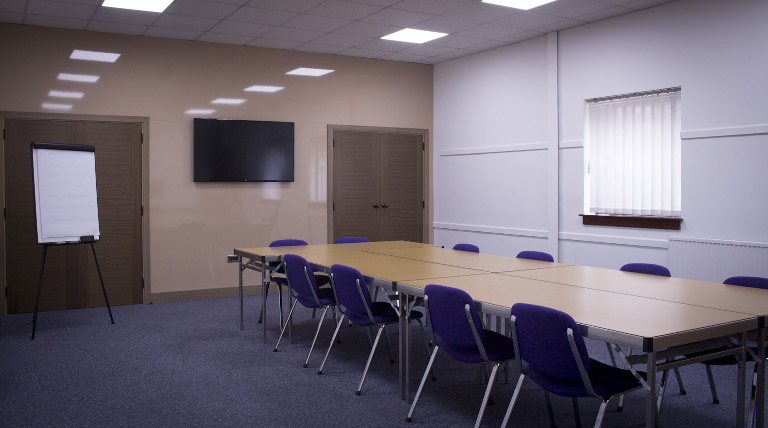 The Meeting Room can hold up to 20 people in a theatre style and 12 people around the board room table. Hire price includes self service tea and coffee, flipchart, whiteboard & pens, screen, data projector and wi-fi. The room measures 6.5m x 4.3m. Half day bookings are defined as 2.5 to 4 hours in duration. For all Bookings including catering requirements and equipment needs please contact Reception on 0117 941 5800. Bookings MUST be completed by completing our online booking form and we will confirm the booking via email. Should you wish to re-schedule the booking for another date within one month of the date of the event, no charge will be incurred. We allow a booking to be rescheduled only once; after this the above cancellation policy applies. Any other amendments to bookings such as time/layout will be treated individually.